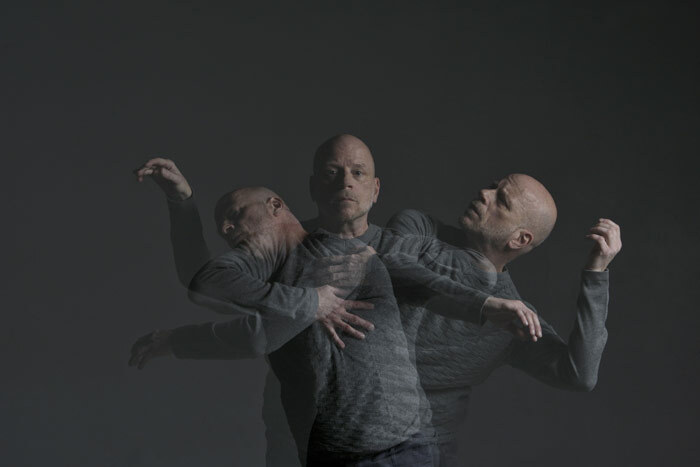 Three choreographers, three solos, one Joe Laughlin. Each of these solos reflected the distinct style of its creator while allowing Laughlin to show off his versatility as a performer. At stage right was a small dressing room area where Laughlin paused between solos and sat in contemplation as voiceovers of conversations with his collaborators filled the space. These conversations were integral to binding the three pieces together while allowing us into the creative process. “Everything for me is a feeling, and then I act on it,” Laughlin’s voice explains as the first piece began and we heard from Amber Funk Barton describing her piece Silas as being a heroic day in a mundane life. Playful and contemplative, Laughlin’s precise, controlled movements were light and optimistic against the backdrop of Arcade Fire’s “Wake Up” as interpreted by Vitamin String Quartet. The beautiful, emotionally rich music propelled his movements as if he was searching for some unknown ideal. Gioconda Barbuto’s Long Story Short was inspired by photos from Laughlin’s life set to music composed by Owen Belton. A personal and layered piece built from memories and past experiences, Laughlin danced with a jacket that seemed to symbolize a significant experience or time in his life. While the emotional richness of the performance was impressive, it was difficult to understand the narrative arc of the piece. GIYA by South African choreographer Vincent Mantsoe was more upbeat and layered tango and contemporary influences to create a celebratory piece for Laughlin. Mantsoe’s voiceover discussed the different ways of moving and expressing oneself with age and a changing body. Physical virtuosity isn’t everything, and sometimes the experience and emotional depth of age adds much more meaning than an impressive jump or high kick. While this collection of reflections felt a bit like a swan song to culminate an impressive career, I’m sure Laughlin will soon be back where he is most at home: on stage.